Lookin' good Steve. Defiantly looks like a ton of work on those windows. windows are looking quite nice. How will you do dark vs. lit? Thanks for the support about the windows! Yeah, I know some aren't perfect but I am gonna steal a page out of Spencer's builds and have ordered a needle point diamond bur set so I can may give some of the knarly windows some proper shaping. @Spencer - I got those files from Micro something or rather and they were too big - STILL! I have thought about modifying them - we'll see. 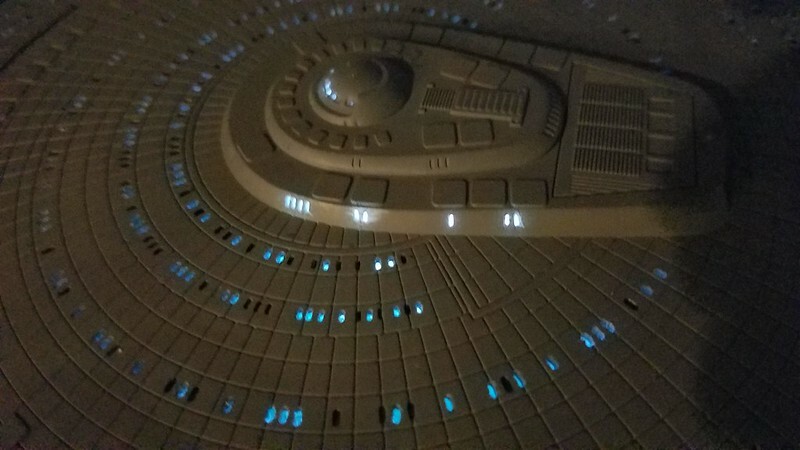 Although this class of starship wasn't eye candy to me at first, it has grown on me over the years, but that original blue paint job does nothing for me, so I'm glad to read you'll be going with diff colors. Best windows/slots I've seen are produced with an endmill.... but it's impossible to use these cutters free hand and get accurate results. I actually had to look up what an end mill was - not sure I understand it anyway. I had thought my dremel press would work but I could figure out how to stablize the saucer and aim at the same time. Simple minded me. Again, thanks for catching up! @Shawn, glad to see you're off your deathbed, Buddy! @Scott, i have given your question some thought. 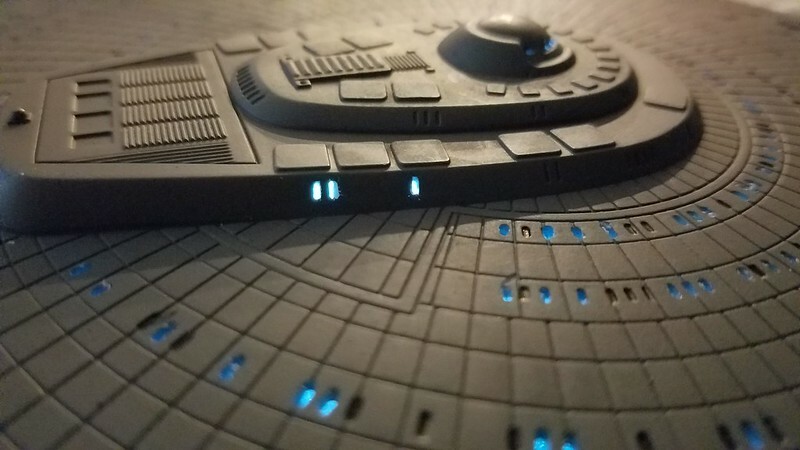 Angryscifimodeler, who did an awesome build of the C used Tulip Paint for the "off" windows. He hinted it might be a bit messy and stain the model. I'm thinking a sharpie or paint pen might work pretty well. Haven't tried it yet but, again, we'll see. 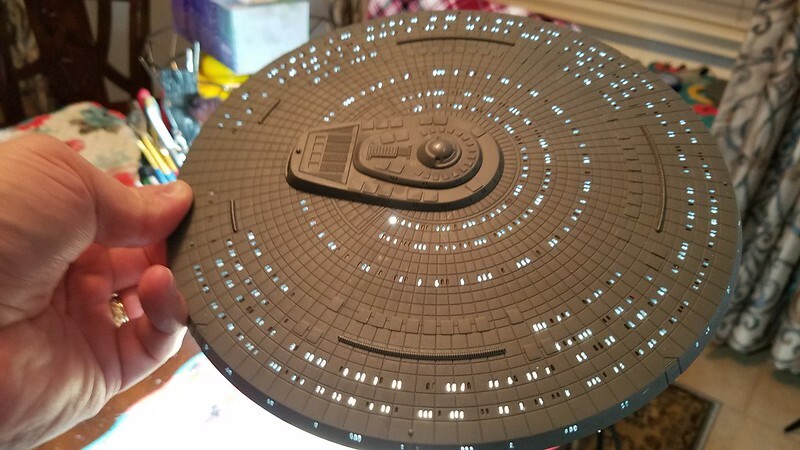 I finally got most of the saucer drilled out - except for the B/C deck; those windows are a different size. I still have to try and finish up the secondary hull, too! I may go ahead and start masking out for the paint scheme while I am waiting on my diamond burs. I still haven't even set up the lights yet. Ah, well! What an enjoyable hobby! Hope the burrs help you clean out the ... uhh ... burrs and are small enough this time. Also I've heard, but never tried it, if you brush a sparingly thin bit of liquid cement around the edges it can help to smooth them out a little. I'm not quite off my deathbed yet. Still recovering from the flu, but thank you for the good vibes Steve. Anyway, that looks great so far. I always admire your patience and precision. I think the "C" is going to look great when you are done. Nicely done on those windows! I actually picked up a Yamaguchi in order to not have to drill the windows (it's a clear kit), but yours looks fantastic. I'll be paying close attention. Looking awesome! Keep at it, there is a ton of windows in there, lol. Thanks for the support guys! Very much appreciated! Spencer, I've not heard that. Interesting! (As Mr. Spock would say.) I will try that and see what happens. I did come up with a technique that seems to be working for me on the openings. More on that in a bit. @Matt, yeah I've read ALOT of guys have said here on the thread that they have picked up the clear Yamaguchi instead of having to drill out the windows. When I was gifted mine, I didn't know they had a clear one. Beside, trekriffic, I think, said the clear model presented it's own set of challenges (i.e. brittle material). But I think Boyd did a build of of the clear C and he seemed to really like it. Most of the windows on the primary hull I did with the 0.70mm dental bur, but the B/C deck has smaller (skinnier) windows; closer to 0.50mm. So, back to the Pin vice. Here's a couple of shots of the B/C deck in progress. I'm happier with how these turned out than I am with the saucer windows. I took a page from dentistry and cut a very thin strip of 600 grit sandpaper and threaded it through the window. After a couple of pulls, it seems to have cleaned up the edges. I know they're not perfect, but they're closer than the other windows; for now. Thanks, as always for the encouragement and the comments! Really nice work on the windows, Steve. Threading a strip of sandpaper thru them? Wow, that's a technique I hadn't considered! Watching with interest! This has so much more detail than the 1/2500, what with the panel lines and raised escape pods. As for how to do the windows off/on, I have a possibly difficult (or perhaps just painstaking) solution. Drill them all out. For the 'dark' windows, you just cover them from the inside with strip styrene. Once painted, you fill them all with Krystal Klear. For the dark windows you could tint the Krystal with black paint. as you won't apply the Krystal Klear until all painting is complete, a little bit on the exterior is easily wiped away. This will be a quick update - nothing monumental. Thanks, Al! Sometimes the simplest solution is the best. Thanks for hangin out! I will need your and other electronics gurus help in sussing out the electronics - although they will be more complicated than anything I have built before. Yeah, I'm impressed with detail in this thing, too! I will be trying to add a "few" extra details without going Protector crazy! ...and my mind went into overload! "Drill out al...ALL of them?! Surely you jest?!" Your suggestion sounds like the best way to do the "off" windows but I may still stick with the "paint them in". Although, I may use your suggestion on the 350 TOS Enterprise I will build in the near future; so thanks. I broke another drill bit (0.50mm), I thought I could avoid it, while working on the B/C deck. So, I ordered some more Tungsten carbide dental burs which SHOULD arrive Wednesday. So until then, I worked on my light scheme. Here is a pic of the breadboard - with switch and 12V power supply plugged in. I know the single red, white and green will be connected to the flasher unit for the formation lights, but I have to figure out how to connect them. 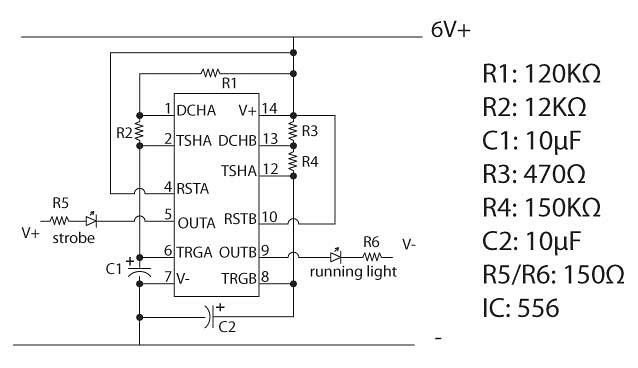 Tankton kindly gave me the schematic below and I have a 556 Timer circuit to play with, so I will be baby-stepping through how to connect this up. 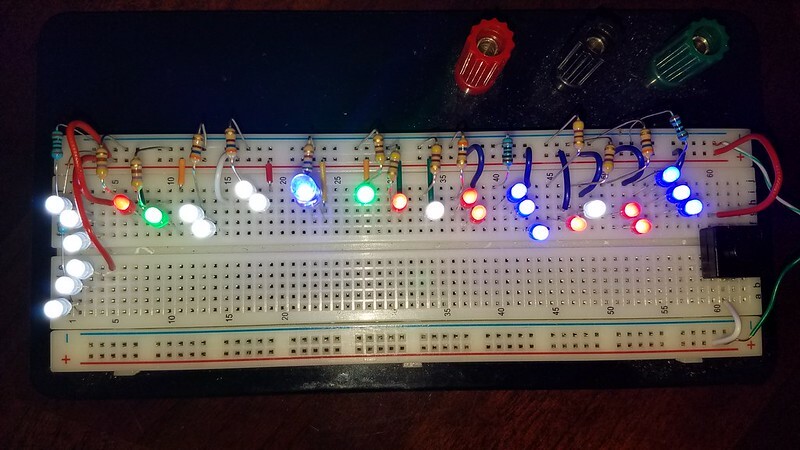 I want to try and put it on a circuit board eventually, but I will have to test it out on the breadboard first...ya know...after I learn how to read a schematic. As always, tips, suggestions, and recommendations are always appreciated! Nice lights and saucer Steve. Making some great progress there for sure. Hey Steve this is where I got my 555 timer pcb's from. Just add parts.